On the first night after the clocks went back, I headed off for a early night with a glass of red wine, my favourite Ludovico Einaudi cd playing and began reading The Little Book of Hygge by candlelight. What is hygge? Well that’s what this book aims to explore. Hygge (roughly pronounced hoo-ga) is a Danish concept but well known throughout the Scandanavian countries and now becoming more familiar here too. We don’t have a word in English which translates hygge directly but it’s the idea of cosiness – essential in the cold Scandic countries with their long winter nights. In this book, the author looks at the history of hygge, how hygge is embraced in Danish culture and her own attempts to bring some hygge into her own life. I must admit that I wasn’t too interested in the section about design and what furniture to have to make your house hyggelig. Nothing against the author’s writing, just not something I’m that into. It did make me smile when I read that I could make my bathroom more hyggelig by putting an armchair near the bath. Not in my small bathroom I couldn’t! I had a Kindle copy of the book but I think this is a book which would definitely benefit by being read as a physical copy. There were photographs throughout and I feel these would be best appreciated in full colour on the page. However, I was really interested in the concept of hygge being about cherishing yourself and taking pleasure in the ordinary everyday experiences of life. It is thought that the word hug may be related to hygge and that seems to sum up hygge for me. It’s giving yourself a virtual hug, doing something that makes you feel valued and good. So hygge can be chatting with a friend, enjoying a glass of wine by the fire, sharing home cooked meals with family, walking through the woods, reading a good book. This is the kind of hygge I can relate to rather than re-arranging the house or buying new Danish designer furniture. Simple pleasures, nothing materialistic, achievable. In fact, it seems that many of the things I enjoy doing now are already hyggelig. An enjoyable, very readable introduction to the concept of hygge. This book is just right for this time of year as the evenings are dark and the weather starts to turn colder. You may find some ideas which will make you embrace the idea of hygge or you may find like I did, that you already enjoy many things which could be hygge. And that just might make you feel a bit more hyggelig! Candlelight is hygge; the smell of freshly brewed coffee is hygge; the feel of crisp, clean bed linen is hygge; dinner with friends is hygge. ‘Hygge’, pronounced ‘hoo-ga’, is a Danish philosophy that roughly translates to ‘cosiness’. But it is so much more than that. It’s a way of life that encourages us to be kinder to ourselves, to take pleasure in the modest, the mundane and the familiar. It is a celebration of the everyday, of sensual experiences rather then things. It’s an entire attitude to life that results in Denmark regularly being voted one of the happiest countries in the world. So, with two divorces behind her and her 50th birthday rapidly approaching, journalist Charlotte Abrahams ponders whether it’s hygge that’s been missing from her life. Is it a philosophy we can all embrace? In a society where lifestyle trends tend to centre on deprivation – be it no sugar, no gluten, no possessions – what does cherishing yourself actually mean? And will it make her happy? 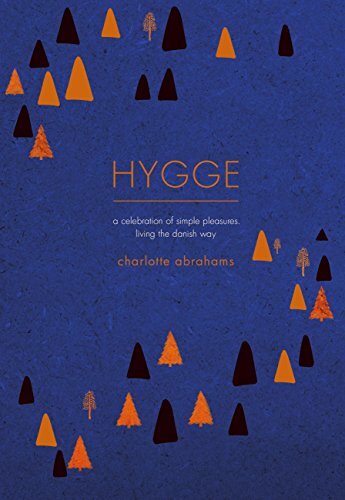 In Hygge, Charlotte Abrahams weaves the history of hygge and its role in Danish culture with her own attempts, as an English woman, to embrace a more hygge life. In this beautifully written and stylishly designed book, she examines the impact this has on her home, her health, her relationships and, of course, her happiness. Light a candle, pour yourself a glass of wine, and get ready to enjoy your more hygge life. I do like the sound of this philosophy which is about being kind to yourself and appreciating the simple pleasures in life rather than denying yourself although I’m not too sure how practical it is for anyone to have an armchair in their bathroom! Indeed! Or a sofa in the bedroom which was another suggestion. Suppose it depends on the size of your house really. But being kind to yourself is always going to be a good thing. This sounds really interesting. I might have to pick up a copy. Thank you. Yes it was good to discover I’m enjoying hygge already!